On Saturday, Pj had to work a little later than expected so my sister came over and we went to this enormous annual flea market. It was miserably hot so we didn't stay long but I did score some amazing vintage finds, even though we arrived 2 hours before closing time. The day was so hot that our feet burned if we stood in one place too long so I'm surprised that I spotted any good finds at all! These pink 50's cat eyes were in pretty bad shape. They were bent all out of shape and very dirty. The 40's pair were also extremely dirty but in pretty good shape considering the age. I gave them both a good soap and water scrub down when I got home and ran the pink pair under a very hot tap and bent them gently and slowly back into shape. Olivia has tried to claim the pink pair for her own all week so they are now locked away where little hands can't break them. I think I will need to find a pair of pink sunglasses for her too! I've been searching for a pair of crochet gloves for over a year but I haven't been able to find a pair that fit...story of my life! I found these buried in a box of scarves and vintage linens and fell in love. From the same seller as the sunglasses, I spotted this train case a mile away. Trying to not look too excited when I couldn't find a price tag, I took a casual peek and prepared myself to make a deal with her but she said "5 Bucks and it has the key"....needless to say, no dealing necessary! I adore the shape of this case and the lining and little purse make it extra special. Like many gorgeous train cases this thing smelled like it had been filled to the brim with cheap perfume so I set it outside for 2 days, open to let it air out then set a dish of baking soda inside and closed the lid. Works beautifully! A gentleman and his wife had a wonderful booth filled with old children's books, watch pieces, tools and vintage home decor. I almost overlooked this little hat until I saw it peeking out from a hat box. It needs a new veil and maybe some millinery flowers but it's a beautiful base to start with. See the other side of the hat in the photo above. Speaking of flea markets, check out this post on how to shop at a flea market by guest blogger, Liz from Zilredloh on The Girl With the Star Spangled Heart, all about how to shop at a flea market. Stephanie is on vacation this week so she has lots of fabulous guest posts scheduled, including a sewing tutorial by yours truly coming tomorrow! Wonderful finds! I collect crochet gloves and have them in many colors. The only color I didn't had was beige and when I saw them they never fit. My boyfriend ran into a pair, and without me knowing it, he bought them for me as a surprise. And they fit pérfectly! I should send him out more to find me some lovely vintage! hope you didn't burn in the heat, send some our way! amazing finds! 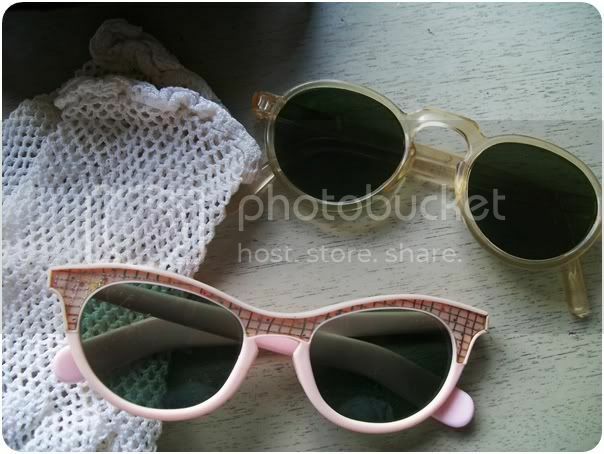 :) i wish there were flea markets out here but no hahaha of-corse now hahaha everything in the LA area has to be expensive especially if its "vintage" hahaha its a pain and annoying haha but thankfully there are 2 good thrift shops in my area haha but thats all i got :( i love the sunglasses they are just adorable! Wow those glasses are so amazing! I'm going to try my hand at making a pair of crotchet gloves. I have a very hard time finding gloves that fit me too. What fun finds! I LOVE the little checkered pattern on the top of those pink glasses. And what a deal on the train case. 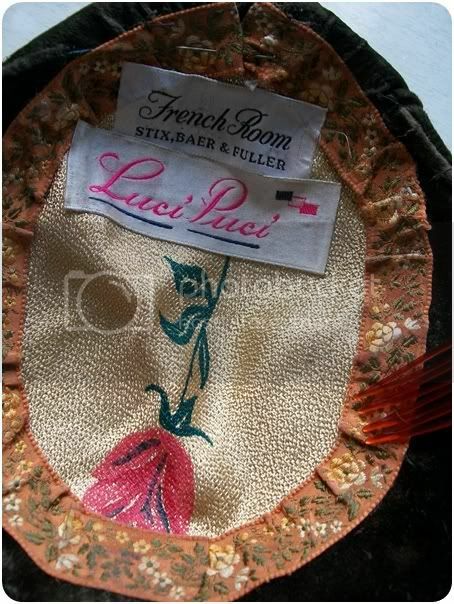 The little bag and fun lining fabric is just great! Flea markets can be awesome. The ones local to where I live are all kind of lame, but I went to a fantastic one in Wisconsin last summer. 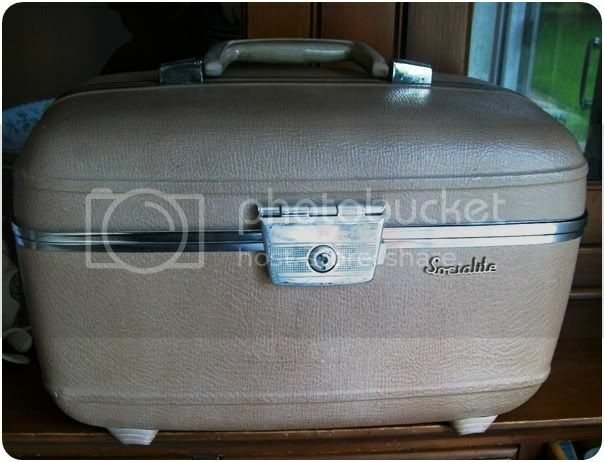 I was the same way with my train case, I nabbed mine for 5 bucks at an estate sale and the inside still smells, so I will try the baking soda trick thanks! Such terrifically lovely (fashionable!) finds. 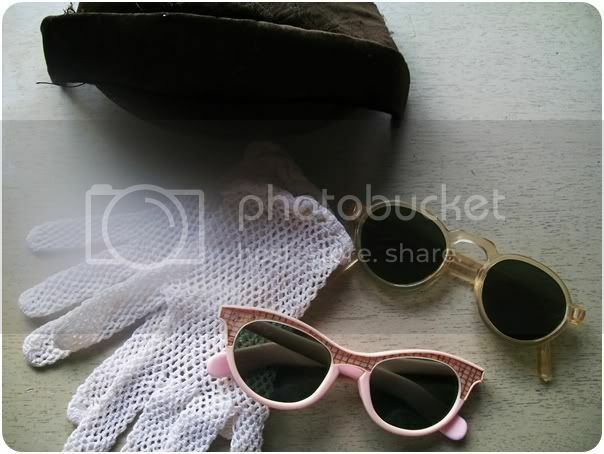 Excellent job of cleaning up/straightening the sunglasses, they look as good as new.